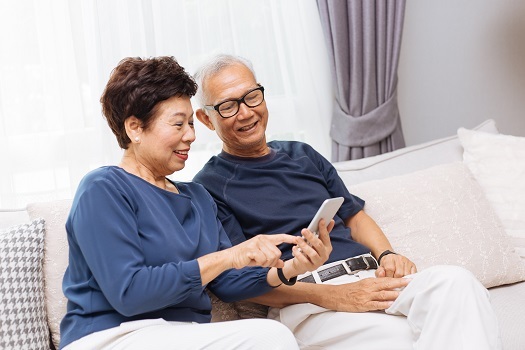 Using a smartphone is challenging for many older adults, but with the right apps, these devices can be invaluable tools. Seniors can use mobile apps to chat with friends, stimulate their cognitive abilities, and even boost their physical health. Here’s a quick look at seven popular apps that are perfect for older adults who want to make the most out of their smartphones and tablets. Even though there are many video chat apps to choose from, millions of people rely on Skype every day. Once Skype has been downloaded, your loved one can make traditional calls, video chat, and even send text messages. Skype is incredibly easy to use, and most of the features can be accessed with a few touches of the screen. It’s a great option for seniors who want to stay in touch with loved ones who are on the other side of the world. Medication mishaps are frighteningly common, and those mistakes can be life-threatening. Pillboxie is a simple reminder app that notifies users when it’s time to take their pills. Setting up this app takes a few minutes, but it’s fairly simple to use once all the pill and dosage information has been inputted. A professional caregiver can help seniors with medication management and much more. If your senior loved one needs hourly or live-in care, Montgomery Home Care Assistance can help. Our caregivers can assist with exercise and mobility, prepare nutritious meals, provide timely medication reminders, and help with a wide array of other important daily tasks. Even if you visit with your loved one as often as possible, you won’t be able to keep an eye on him or her at all times. Fall Detection uses a smartphone’s accelerometer and gyroscope to detect movements, and it sends out an emergency alert if it senses an individual has fallen. It can also be used to send alerts when a senior has been inactive for a set period. An increased risk of falling often accompanies additional medical issues that need to be monitored regularly. There are a variety of age-related health conditions that can make it more challenging for seniors to live independently. However, many of the challenges they face can be easier to manage if their families opt for professional elder care. Montgomery families can rely on expertly trained caregivers to keep their loved ones safe and comfortable while aging in place. Everyone occasionally forgets where they parked, and wandering around a huge parking lot or structure can be quite difficult for older adults. With Park‘n’Forget, your loved one can tap the screen as soon as he or she parks to add a digital marker for that location. Park‘n’Forget can also be used to find loved ones in crowded locations or even set reminders for when parking meters are about to expire. WebMD is a comprehensive medical app that contains invaluable information for people of all ages. In addition to allowing users to check symptoms and read up on common medical problems, this app also has thousands of useful articles that cover a wide range of health topics. The creators release a daily mini-magazine that discusses current studies and medical breakthroughs as well. One of the reasons seniors become so frustrated with smartphones is because the keyboards are relatively small. If your loved one is having difficulty using touchscreen keyboards, suggest downloading Dragon Anywhere. This app will turn anything your loved one says into text, and it works with a wide variety of messaging apps. A long-term study carried out at UC San Francisco revealed that meditation can positively impact a senior’s mental and physical health. Meditating for 10 or 15 minutes a day reduces inflammation, boosts cognitive health, and lowers stress levels. Headspace is a guided meditation app that talks users through meditation and breathing exercises. These amazing apps can stimulate cognition, boost mood, and enhance safety for seniors, and so can having a compassionate trained caregiver close by. Seniors can face a variety of challenges as they age, many of which can be mitigated with the help of professional in-home caregivers who provide high-quality home care. Montgomery families trust Home Care Assistance to help their elderly loved ones age in place safely and comfortably. If your loved one needs professional care, Home Care Assistance is here to help. Reach out to one of our Care Managers today at (334) 593-3988 to schedule a free in-home consultation.